One example is the 9 night Pacific Island Hopper cruise on the Pacific Pearl departing Auckland on 7 May, priced from $749 per person twin share. Ports of call are Noumea, Port Vila, Lifou and Mare. See all four cheap cruise deals via House of Travel – Update: the deals have sold out but see the Pack’n Go fares via P&O. In 2012 we boarded the Pacific Pearl in Auckland and travelled to Sydney on a comedy themed cruise. We laughed a whole lot and met some interesting people around the table at Waterfront Restaurant. Prior to departure I was concerned about the interior cabin (no windows) we’d booked, the type of cabin you’ll likely get if you book a cheap deal. I was worried about feeling claustrophobic, however the cabins have a set of closed curtains and they did the trick for me as I never even thought about being closed in. We’ve got a couple of tips for first timers on Pacific Pearl – take something for sea sickness just incase, and if you don’t like buffets dine a la carte at Waterfront Restaurant, it doesn’t cost extra. If you’ve been thinking about booking a cruise now could be a good time as with prices from as low as $83 per night for 9 nights it’s a cheap way to ‘dip your toes in’ and see if cruising is for you. 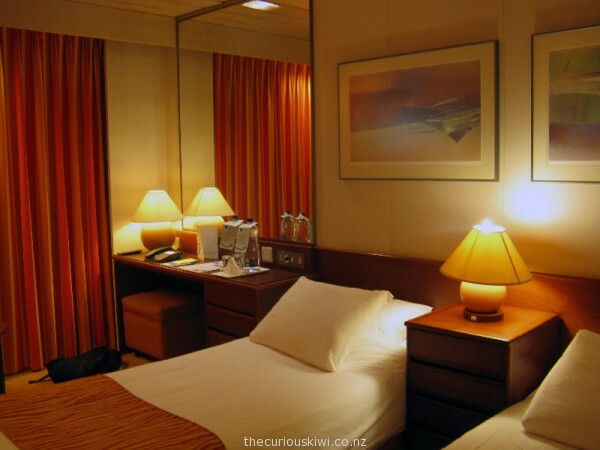 This entry was posted in Travel Tips & Deals by thecuriouskiwi. Bookmark the permalink.